Rep. Ed Royce (pictured center) stands with student-artists during the 2018 Congressional Art Competition Awards Ceremony this past Saturday in Fullerton, CA. 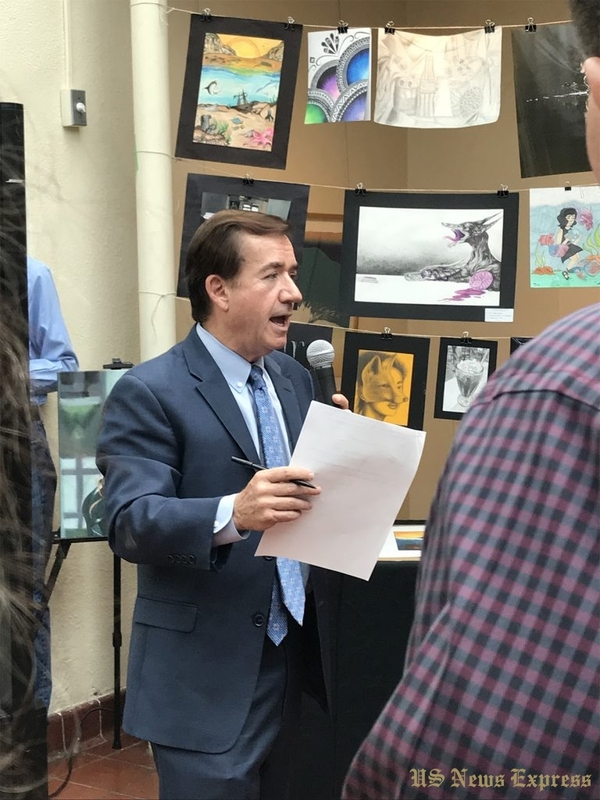 WASHINGTON, D.C. — U.S. Representative Ed Royce (R-CA) hosted the 2018 Congressional Art Contest Award Ceremony at the Muckenthaler Cultural Center in Fullerton, California this past Saturday. 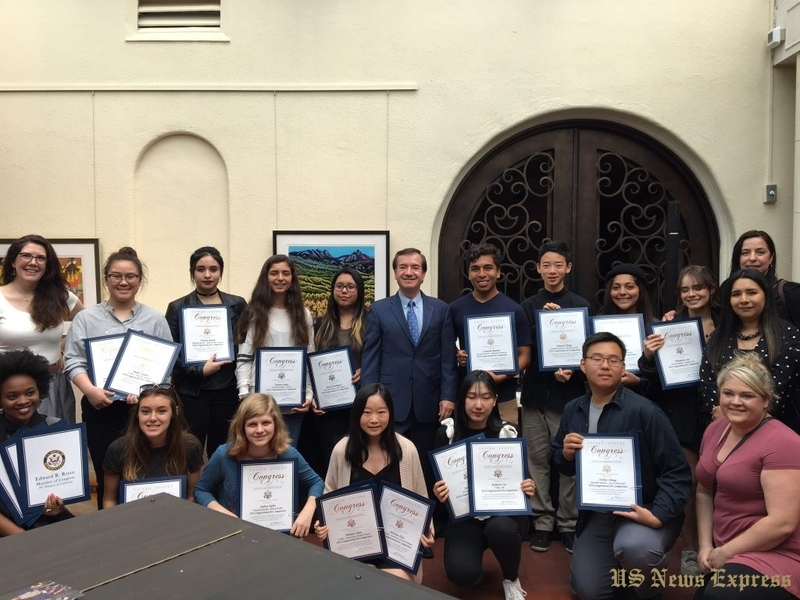 Over 200 local high school students from California’s 39th Congressional district displayed their artwork for the public, and awards were presented to two dozen students. A panel of independent, local judges determined the winning submissions. The winner of the online, public contest known as the “Fan Favorite” was also recognized with an award. Christine Zhou from Diamond Bar High School (pictured below) won first place for her piece “Portal into a World of Dreams,” which will be on display in the Capitol for one year alongside winners from other congressional districts. Christine’s piece was also selected as the “Fan Favorite” which received 480 votes out of a total of 4,606 votes. 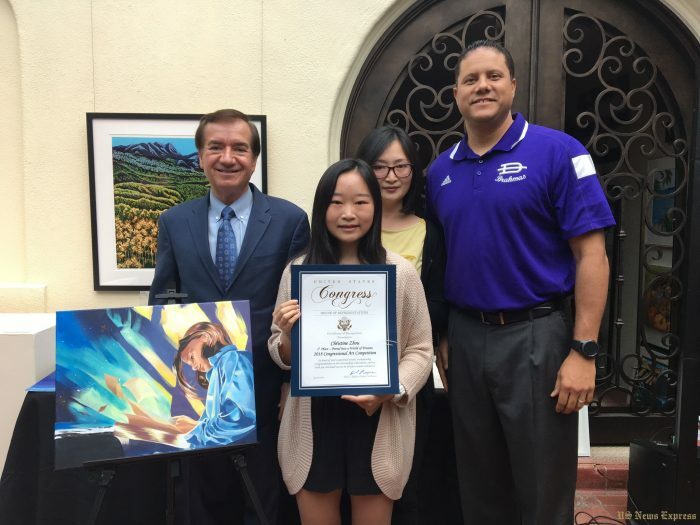 Christine Zhou (pictured front, center) from Diamond Bar High School was joined by her mother and DBHS Principal, Reuben Jones, as she accepted the award for first place from Rep. Ed Royce. Other submissions that received special recognition from the local judges are listed below. All art entries were published on Rep. Royce’s Facbeook page and can be found HERE. The Congressional Art Competition is a national contest organized once a year to give high school students the opportunity to showcase their artistic abilities. All high school students within California’s 39th Congressional District are encouraged to submit their favorite piece of original art to the competition. The Grand Prize Winner of the competition receives 2 complimentary round trip tickets to Washington, D.C. to see their artwork displayed in the Capitol Building, and is invited to an exclusive reception in their honor. Only one winner will be chosen for each Congressional District.